I’ve often heard people say things like “The weather comes in quick in the mountains” and never quite known what it means. Surely they can at least be more specific than ‘weather’? And shouldn’t that be ‘quickly’?! Well, we experienced it yesterday first hand. 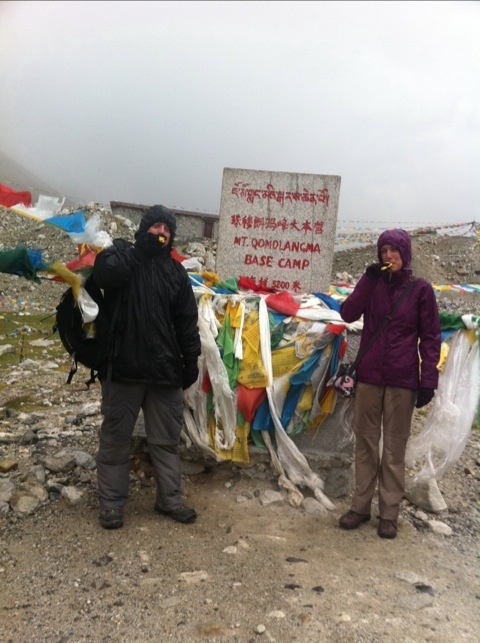 The Chinese for Everest is Qomolangma, in case you wonder where we went in the photos. It’s a short walk up to Base Camp from where we were staying in a very basic hostel, and we started in brilliant sunshine – like a hot summer’s day in Britain thanks to the altitude. Unfortunately we couldn’t see the famed mountain itself thanks to cloud over it (Base Camp is still 20km from the summit, of which 3.5km is upwards, with us at 5000m and the summit at 8500m). We’d been walking for 15 minutes when a translucent sheet of, well, weather just hit us. And it was quick! Within a few seconds there was rain, then hailstones, and an inkling of snow as an icy wind swept in. The sun kept shining through, so somewhere there was probably also a rainbow which we’d have seen if we weren’t desperately hunting for fleeces, waterproofs, hats and gloves. I’d love to be able to tell you the hailstones were the size of golfballs, but alas they weren’t. Laura and I concluded they were about the same size as the Calypso flavoured ice balls if you’ve ever encountered them – or small gravel if you haven’t. Basically normal hailstones. Base Camp itself was pretty underwhelming, especially because a) we couldn’t see the mountain, and b) there was nobody there but us since it’s not mountaineering season – just a rocky plateau where people would camp with apparently amazing views of the mountain if there wasn’t heavy cloud. 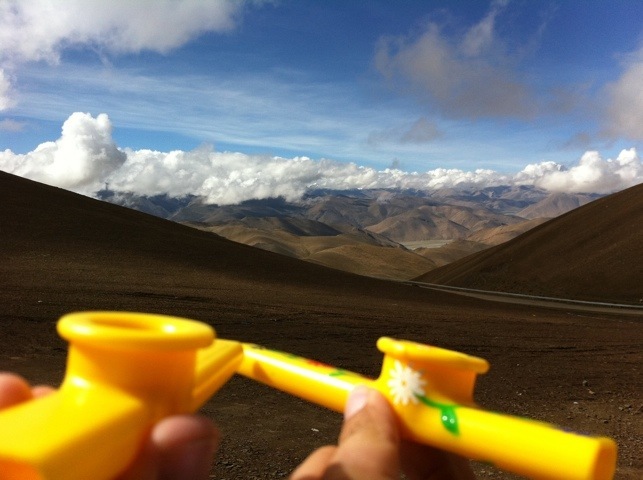 We got the obligatory kazoo photo (I’m pretending to be a yeti, in case you wonder), sent a postcard from possibly the highest post office in the world (it’s a tent), and retreated into the (ahem) bus journey down. 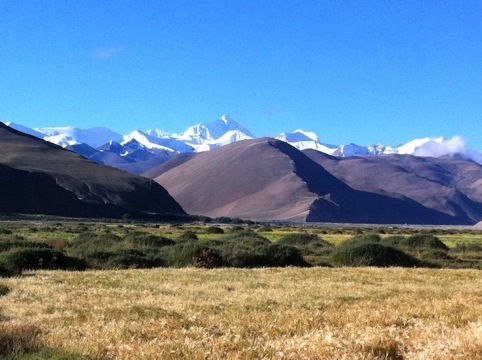 Our accommodation for the night was effectively a camping barn with beds, and lots of blankets – and at least in theory an Everest view from your pillow. We cocooned ourselves from the cold, and made use of the oxygen canister we’d bought, unsure whether we’d been sold compressed air or actual oxygen. We still don’t know either way! Fortunately the altitude wasn’t too tough – just some minor headaches and getting out of breath from hefty tasks like folding blankets. The following day was my birthday, and it was fantastic. Being woken by a rousing Happy Birthday song at 7am more than made up for the clouds still obscuring our bedside view of the mountain. One of the group got a clear photo at 3am lit by moonlight – hopefully we’ll get a copy. Our 10 hour bus journey saw us retrace the previous day’s dirt track for 102km, before (after applause for the driver) we headed west, over passes and barren plains before we started our descent into Zhangmu on the Nepalese border. A 2.5km descent on winding mountain roads is an adrenaline rush at the best of times, but the rain and mist that hit us as we sunk into an amazing deep gorge made it an incredible if slightly stressful experience! Waterfalls hundreds of feet high, sheer cliff faces and all manner of tropical vegetation seemingly floating in mid-air, with a twisting road disappearing into the mist ahead and an occasional blast of the horn as the driver checked nobody was coming the other way. Our confidence wasn’t exactly boosted by occasional stretches where the (fairly new) safety rail had been torn from the concrete by vehicles that had opted to take the quick route to the bottom! Zhangmu is a salubrious traffic jam of a town, and had more than its fair share of character, which was great after some of the soulless places we’d stopped in. It is essentially a set of buildings around a single steep hairpin-twisted road, with sheer drops in every direction. 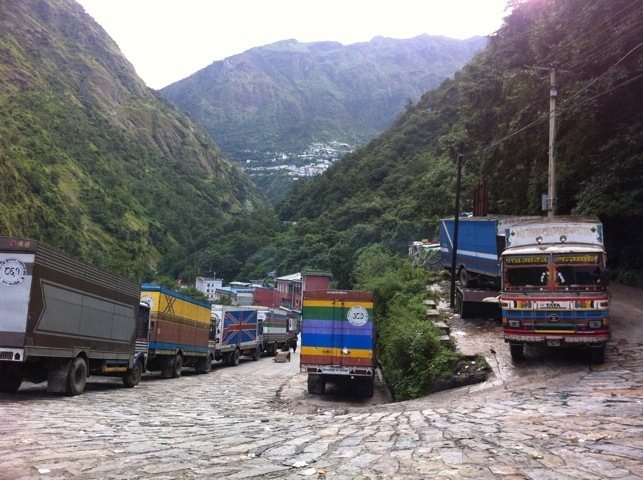 What better place for hundreds of lorries transporting goods between Nepal and Tibet to exchange loads! dance of edging forward optimistically only to have to reverse back long distances to find a passing spot, along with the three lorries, two taxis and police car behind you. We saw one car trying to squeeze round an obstacle with half its tyre over the edge and a cliff face beneath! To cap off a very different but delightful birthday, we finished with curry (yak of course) and a club. Brick Lane it may not have been but it was great fun, and we made it in one piece!